Rainfall deficit is worse than the 1930s Dust Bowl. 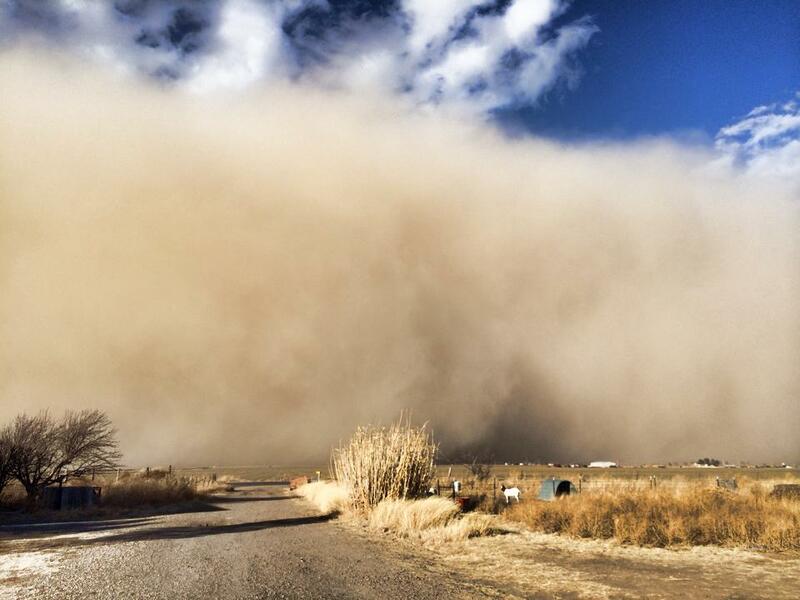 Like a steamroller, a dust storm approaches Cimarron County in the Oklahoma Panhandle on January 12, 2014. Click image to enlarge. Drought is deepening in the southern Great Plains, a beleaguered region whose four-year dry cycle has been like a roller coaster ride through a high-velocity hair dryer. Soils are baked and blowing, farmers are nervous, and groundwater tables continue to fall. 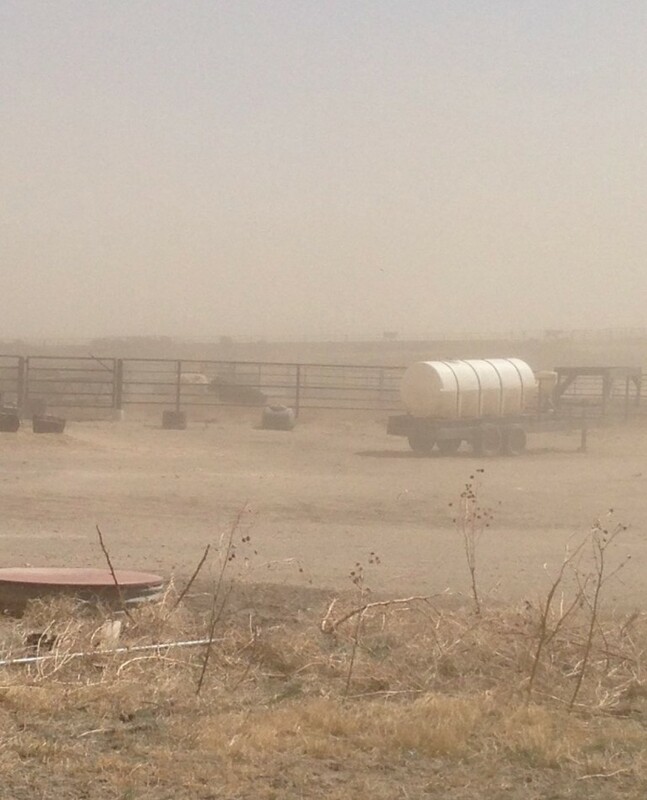 Clawed by 60-mile-per-hour wind gusts and roasted by a warm, dry spring, the strip of land from southwest Kansas to the oil fields of the Permian Basin in Texas plunged swiftly in the last three months into the depths of drought. Every county in the panhandles of Oklahoma and Texas is in the worst category of the weekly U.S. drought rankings. The Ogallala drought is the second penetrating dry spell in a critical U.S farm region. Deep drought also is challenging the Central Valley in California. Scientists expect precipitation patterns in both regions to be substantially altered in the coming decades because of a warming planet, findings underscored in a comprehensive national assessment of the changing climate released last week. Average U.S. temperatures increased nearly 2 degrees Fahrenheit since 1895, amplifying the intensity of droughts. The sudden deterioration today in the middle of the country continues a recent worrisome development. The 42 months from October 2010 to March 2014 were the driest such period on record for the Texas Panhandle – worse than the Dust Bowl of the 1930s and worse than the great drought of the 1950s, according to the Natural Resources Conservation Service. For the southern plains, that means tapping groundwater. The region relies on two sources of water to produce some of the most bountiful corn, cotton, and wheat harvests in the nation: water from the sky and water from the Ogallala Aquifer. The Ogallala, lying beneath eight states, is the nation’s largest freshwater aquifer and the reason why the Great Plains are the American breadbasket. Yet it is a finite source. The aquifer’s southern fringe is already pumped dry. 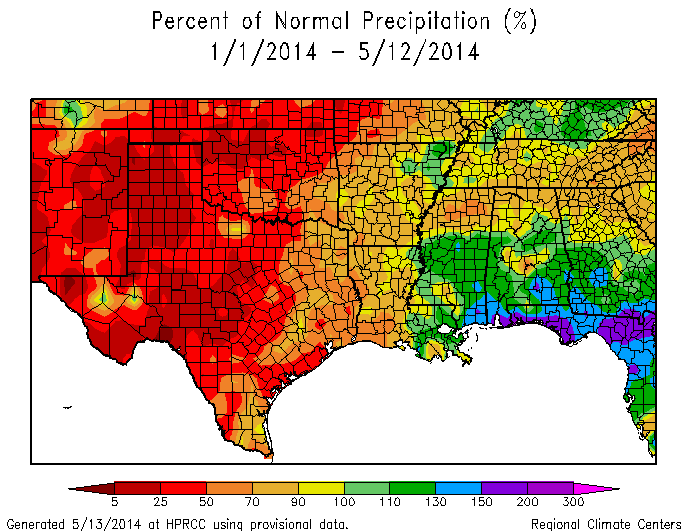 Rain in the southern Great Plains has been scarce in 2014. In the year’s first five months, the Texas and Oklahoma panhandles received less than half of normal precipitation. Click image to enlarge. With rainfall totals this year less than half of normal at best and just 10 percent of normal in the worst areas, farmers will lean on the aquifer as never before, said Zimmer, whose district is charged with regulating groundwater use. Farmers in the North Plains district are allowed to pump 18 inches of water per acre from the aquifer each year, but they can carry over unused portions of their allocation. Zimmer said many farmers will drawn on those banked savings this year, thus accelerating the annual pumping rate. A brown haze filtered the sunlight as a dust storm blew across a Wichita County farm field in western Kansas on April 27, 2014. Click image to enlarge. A similar scenario is playing out in neighboring states. Mark Rude, executive director of the Southwest Kansas Groundwater Management District, told Circle of Blue that soils are so dry and rain is so scarce that only farmers with the most productive groundwater wells will be able to raise a crop. “It’s really putting pressure on our groundwater supply, which has seen six-plus feet per year of decline recently,” said Rude, who would not speculate how much water would be pumped this year. Crops, indeed, are taking a beating from the relentless wind and sun. The U.S. Department of Agriculture forecasts that winter wheat production will drop by 9 percent nationally. Much of the drop is due to anticipated declines of 18 percent and 40 percent in Kansas and Oklahoma, respectively. The two states were first and third in U.S. wheat production in 2013. Farmers are taking extreme measures to lock down their soil. Some are tilling the land to bring up clods of dirt to act as miniature wind breaks. Others are spreading manure on the fields, creating ripples of organic matter in a desperate attempt to protect loose soil. “There’s not even enough moisture now to germinate weeds,” observed Zimmer, who grows corn, wheat, and milo, in addition to raising cattle. Zimmer’s neighbors are tense and anxious, he said. The start of 2014 casts a shadow similar to the first few months of 2011, when Texas endured its worst single-year drought, a calamity that cost $US 7 billion in agricultural losses and cut cattle inventories to a 40-year low. Without much rain since, water resources in the Texas plains still have not recovered.